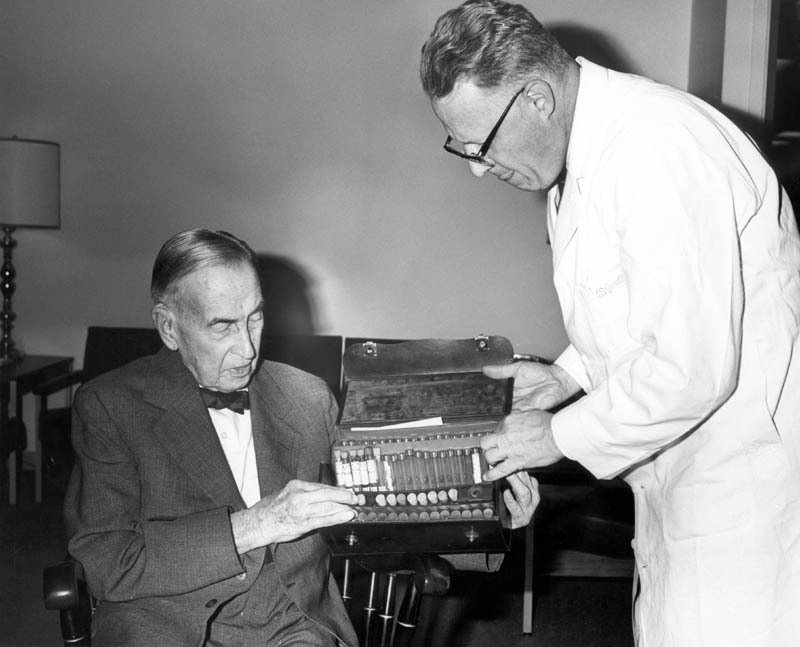 Chauncey B. Borland (left) and Rush Medical College Dean Mark H. Lepper, MD (right), present a 75-year-old medical kit to the college in this 1971 photo. The kit was made for Borland — a longtime trustee of St. Luke’s Hospital — by a New York pharmacy to take to Canada. It contains 69 different elements used for medicine during that era and is now housed in the Rush University Medical Center Archives. This entry was posted in Rush Archives, Rush University and tagged chauncey borland, mark lepper, rush medical college, st. luke's hospital. Bookmark the permalink. 1971 seems like yesterday. I am so grateful for the advancement in medicine since that time, let alone from the 75 year old kit. Keep up the excellent work.